I had planned on attending 3 stages of the USA Pro Cycling Challenge presented by Millennium Promise. Yes, I refer to it by it's proper name every time I say it, don't you? I ended up attending only 1 stage instead. Vail was great - TDF caliber riders, TDF quality backdrop, without the TDF traffic nightmare. So why did I not go to the stages on Saturday or Sunday as planned? I looked at the route again, and realized the race was all but over after the TT. Since there are no summit finishes, unless Levi hit an elk on the descent, it was going to be another bunch/sprint finish. At this point, I have to admit I have been to some big races, including the TDF 4 times. I guess I am a bit of a race snob, but if I had to decide between riding myself and watching sprinters not named Cavendish or Farrar duke it out, I will pass. I had considered going to watch the climb on Lookout, but with 60 miles still to go after the climb, it didn't really matter what happened on that climb. A buddy of mine form Chicago, who is new to the sport, texted wondering if I was at the race today. I confessed that I was out riding instead. "What's up? Why didn't you go?" So in lengthy texts I had to explain that this race route was really decided by dollars. I get that the goal is to make money, but I question the short and long term money motivation. Fans in CO love cycling, it's a beautiful state, etc, but, that doesn't secure long term sponsors and the big money. 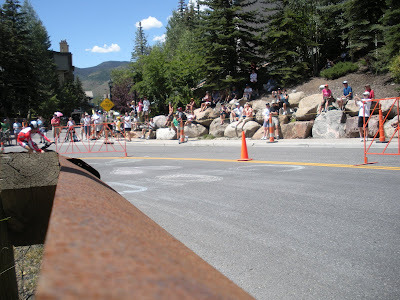 Each start/finish town had to pony up $250,000 to host a stage, so you had towns like Durango and Boulder that wouldn't or couldn't front the cash so they were skipped completely on the route. The $ provided by the sponsor towns is small money compared to big corporate dollars that could follow if you created an amazing and very challenging race. What we got instead of Alpe d' Huez style finishes is a series of Milan San Remo type stages where the GC race was decided 1/2 way through the race. What went right with the USA Pro Cycling Challenge? The fans: They were amazing at this race. Colorado loves cycling and the fans were passionate and loud. They filled the roads near the top of each climb and in every start and finish town. The GC field: You really could not have asked for better GC contenders for a race during it's first edition. Cadel, Basso, the Schlecks and Levi. The back drop: Colorado is one of the most beautiful states, and offers a variety of terrain from desert, red rocks, pine forest, and rocky climbs. The vibe from Fans and Media: Those in and around the race have been very positive about this event and the turnout. The route: I will give it to the ATOC, Tour of Utah and even the Tour de Georgia they used their terrain to make their race difficult and decisive. The Tour of Missouri did not have that option, since there were no real long climbs to get into play. Here in CO, we have plenty of climbs, many of which can be used but were not. This race was decided on Thursday, yet did not officially end until Sunday. The field: If you insist on having a route that allows that many bunch/sprint finishes, then invite riders like Thor, Fabian, Cav, Gilbert and Boonen - at least make it interesting. With all due respect to Elia Viviani, he is not exactly a household name. As I review this week, one of Thor's TDF style attacks could have won this race. SUMMIT FINISH: Let's be honest; that is what makes stage races famous and what shakes up GC! Alpe d' Huez, Mont Ventoux, Zoncolan, Anglirue, Mt. Baldy, and Brasstown Bald. You need summit finishes to make your stage race interesting and must see TV. The USA Pro was more like a series of high altitude Milan San Remos with a few TT's thrown in (1 that was downhill?!). Don't argue logistics, as the Aglirru is more remote than the top of Super James/ Super Flag or Sunshine. Social Media director (or even a teenage kid that LIKES/KNOWS cycling and watches the @feed on twitter): All week long this race has been slaughtered on Twitter about mistakes and typos on their site. The best part is they have someone tweeting about the race, but they don't read/react to their @ messages. @Neilroad and @Dwuori pointed out every error found on their website and they still have not fixed it. 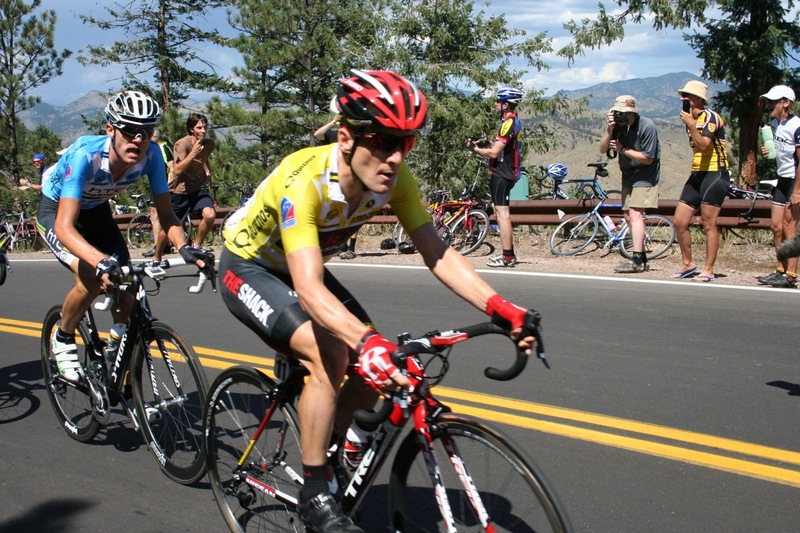 My favorite - this line in the Spidertech Team bio: The team features two top sprinters Keven Lacombe and Phillipe Gilbert, who won a stage of the 2009 Tour of Missouri. The team also features American veteran Jon Patrick McCarty, who won the 2011 Amgen Tour of California KOM jersey and up and comer Zach Bell. If you are going to spend millions and ask start/finish towns to pay you $250,000, at the very least have a novice fan check your website. I even heard that some of these errors made it into print that was handed out at the race. OOPS? Volunteers that had no clue about cycling or what they were really supposed to do: Give me the Gendarmerie any day, since cycling fans police themselves. I had one volunteer chase me out of the inside of a corner (behind a rusty guard rail and in a group of trees) on the TT course and ask me to go across the street and stand where they might end up if they over shot the corner. When I asked her why she said, "It's a closed course." I said you, "You know that makes no sense right?" She went back to her post to wave an orange flag. She later came back over to say, "I really don't know, it's just what they told me." As my wife stated when we attended the TT in Vail, if this race was an the final Challenge on the Apprentice, Trump would have fired them. The Final GC: When this is your final GC, in a state with so many options to make a race brutal and interesting, you have a problem. No offense to Big George, I have met him and I enjoy him as a rider. At 38 years old, he should NOT be in the top 5 GC for a race promoted like this: Breathtaking altitudes, treacherous climbs and 128 of the worlds best riders. It’s the most challenging race held on American soil. I know the riders rode hard and fans cheered their hearts out. I just hope the race organizers do their part so that this can become the "Most challenging race held on American soil." Otherwise, I fear it will end up like Tour of GA and Tour of MO. Simply bad form and does not inspire sponsor confidence in the long run. Thanks again, nice write up. Yes, I am glad you mentioned how annoying it is that the race was decided too early. I even hear the Phil and Paul show trying to talk about Sunday's stage as a ceremonial parade stage, that Tejay or VDV would have been boo'd into oblivion had they dared attack. I'm sorry but you need to race for 3 weeks to earn yourself a parade stage. Plus, you started out with a prologue and had a TT, add in there a parade stage and that gives you what, 3 days of actual racing? Don't get me started on the website, I guess they need to leave some things to be able to work on right? All in all, good race, amazing crowds. Great write-up. As I watched the last stage on the ShackTracker yesterday, I was surprised how much my attention kept wandering. Then I realized, yup, it's boring. We already know who won, and Denver is not that scenic (like the Champs Elysee). I was beside myself to get to watch such an exciting race in my own state, but I couldn't agree more that the course left a lot out. I attended a few stages and watched the rest on TV. Couldn't agree more with your comments. It seemed the organizers wanted to hit the major resort towns (i.e. Aspen, Vail, Steamboat, CB, etc) to sell the race to the Gov for tourism dollars. It worked. There are so many options in Colorado I imagine that next year(if there is a a next year, Quizno's is in bad shape) the route includes less sprinter stages. i too was appalled by the grammatical mistakes, and factual mistakes on the race website. And yes, indeed it looked like a teenager was doing their social media. no hashtags, wrong hashtags, two hashtags, no response to @ msgs, etc. And yes, the race was for sure decided after the Vail TT. But I have to point out that, as part of the organizing committee for the Breck stage, we did not spend anywhere near $250K to put it on.